The New and Improved DynaCycle Cylinder Exchange Program! DynaCycle Refrigerant Exchange Program has been around for years, but we recently worked hand-in-hand with our customers to improve upon our existing program and make it easier and more beneficial for distributors and contractors alike. After some fine tuning we are excited to share that DynaCycle Cylinder Exchange Program is an easy way to get paid for your valuable refrigerants. We are still PAYING for gas! We accept all non-flammable HFO, HFC, HCFC and CFC Refrigerants. DynaCycle is a cylinder exchange program. Similar to a propane exchange program at your local supermarket or home DIY store, DynaCycle will supply you with state-of-the-art composite recovery cylinders and steel recovery cylinders that you can sell or exchange with your customers. Send filled cylinders back to us, and we’ll send you more empties. 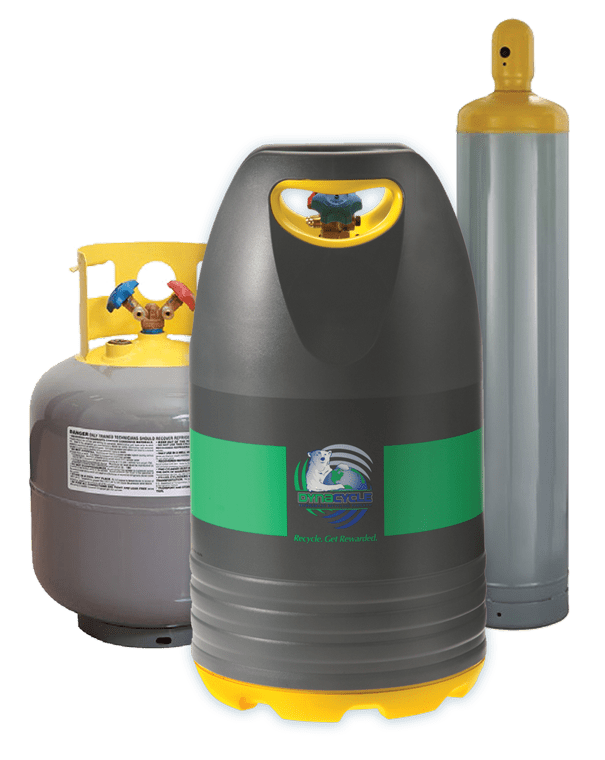 After we receive your batch of recovery cylinders, we’ll test, generate EPA compliant documentation, and pay you top dollar for your refrigerants. cylinders to the distributor’s processing location(s). Your DynaCycle representative will work with you to determine the correct product mix for your initial shipment. You may choose to setup processing centers at individual locations, distribution hubs or a combination of both. When choosing where to establish DynaCycle processing centers, consider the time it will take to receive between 18 and 24 filled refrigerant recovery cylinders in those chosen locations. 3. The exchange: Your customer may exchange a filled DOT 4BA or 4BW recovery cylinder for an empty cylinder of similar type and capacity. There is no processing fee associated with a cylinder exchange. DynaCycle offers both composite and steel cylinders for resale so that distributors can sell an empty exchange cylinder to customers that do not have their own recovery cylinder to exchange. 4. Tagging: Filled recovery cylinders are tagged and placed in the shipping container that was provided by DynaCycle. Distributor personnel will ensure that the DynaCycle cylinder tag is completely filled in and securely attached the customer’s recovery cylinder. 5. How shipping works: When the distributor has packed the shipping container full (approximately 18 to 28 filled 30 lb and 50 lb recovery cylinders), DynaCycle should be contacted to initiate the shipping process and pickup scheduling. DynaCycle will provide you with a pickup date, Bill of Lading and additional packing and shipping instructions as necessary. Similarly, DynaCycle will send a container of corresponding, empty recovery cylinders and tags to replenish the distributor’s processing center. 6. Reporting: Within about ten business days of DynaCycle receiving a shipment of filled recovery cylinders, the distributor will receive a payment report and EPA Compliant receiving report (pdf format) for each technician customer. 7. Payment: DynaCycle will issue payments in the form of check or credit, whichever the distributor prefers. Shipments received by the 20th day of the month will be issued payment at the end of the same month. Shipments received after the 20th day of the month will be paid at the end of the following month. Payments will always be issued less than 45 days from the receipt of a shipment of recovered refrigerant. DynaCycle recommends that distributors share a portion of the program proceeds with their contractor- technician customers in the form of a store credit. In our experience, this policy builds momentum in the program and increases customer loyalty. The contractor pay rate will be left to the discretion and direction of the wholesale distributor. Issuing store credit instead of cash or check allows the distributor to retain some margin dollars on the sale of product. 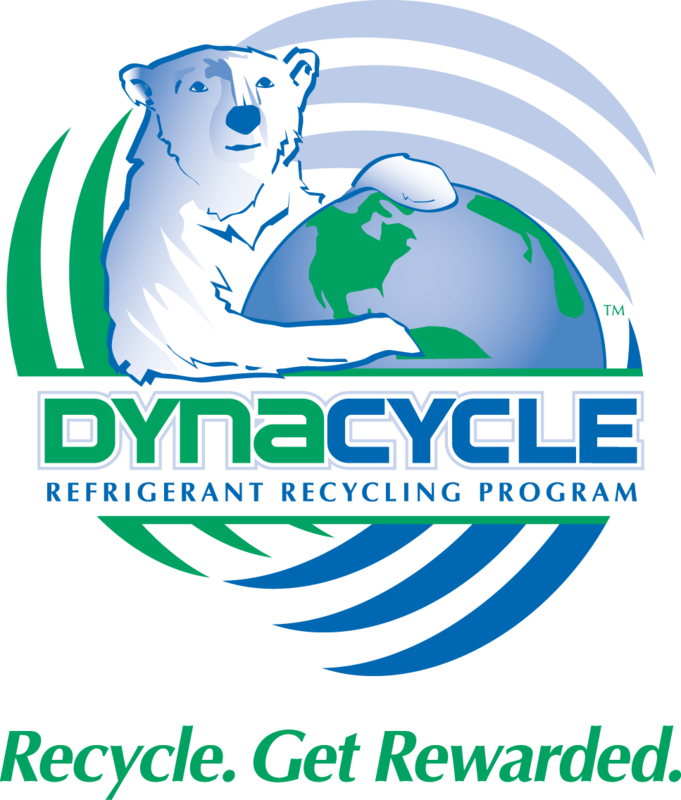 For more information on the DynaCycle Refrigerant Exchange Program please call (717) 249-0157. Author Brad KivlanPosted on April 10, 2019 April 11, 2019 Categories DynaCycle, NewsTags cylinder, R22, reclaim, refrigerant recyclingLeave a comment on The New and Improved DynaCycle Cylinder Exchange Program! While many major international sports teams and groups, including FIFA, Tokyo 2020 Summer Olympics, Formula E, and the International Olympic Committee have already joined the UN Sports for Climate Action Framework, the New York Yankees are the first major North American sports team to join. In the absence of the United States joining the Paris Climate Accord or ratifying the Kigali Amendment, states have begun to draft their own legislation to phase-down HFC refrigerants or intend to create regulations through the state’s EPA office. While many states have announced their plans to reduce HFCs, some states are much further along, regarding the legislative progress than others. Here is an update on where the some states are in the phase-out process. California– Through the California Air and Resources Board (CARB), California is by far the furthest along in its quest to enforce a state-wide phase-down of HFC refrigerants. Beginning on January 1, 2019 high GWP refrigerants (including 404A and 507A) were banned, through the California Cooling Act, in the following applications: New and retrofit supermarket systems, new and retrofit remote condensing units, retrofit stand-alone units, and new stand-alone medium-temperature units with a compressor capacity below 2,200 Btu/hour and not containing a flooded evaporator. On January 1, 2020, they will be banned in: new stand-alone medium-temperature units with a compressor capacity equal to or greater than 2,200 Btu/hour, stand-alone medium-temperature units containing a flooded evaporator, and stand-alone low-temperature units. Prohibition of refrigerants with a GWP of 150 or greater in new refrigeration systems containing 50 or more lbs of refrigerant. Prohibition of refrigerants with a GWP of 1,500 or greater in new refrigeration systems containing 20 to 50 lbs of refrigerant. Prohibition of refrigerants with a GWP of 750 or greater in new air conditioning systems containing two or more lbs of refrigerant. Prohibition of refrigerants with a GWP of 150 or greater in new chillers (refrigeration or air-conditioning). By 2020, no production, import, sale, distribution or entry into commerce of refrigerants with a GWP of 2500 or greater. By 2024, no production, import, sale, distribution or entry into commerce of refrigerants with a GWP of 1500 or greater. For more information see CARB’s website. There will also be an incentive program for low-GWP refrigeration but funding has not been allocated through the California legislature. Massachusetts- In 2016, Massachusetts Governor Baker signed an executive order “establishing an Integrated Climate Change Strategy for the Commonwealth, which included a directive to publish a Comprehensive Energy Plan (CEP). ” In response to the executive order, The Comprehensive Energy Plan was published in December of 2018. It is likely that a short-lived climate pollutant phase-down will accompany the law. New York- Governor Andrew Cuomo directed the New York Department of Energy and Conservation to propose a plan to phase-out HFCs. The DEC released their plan in September of 2018 which begins the phase-down of HFCs in applications like propellants and foam blowing agents in January 2020. Find full proposal here. It is likely that a short-lived climate pollutant phase-down will accompany the law. Connecticut- In 2015, Governor Dannel Malloy issued an Executive Order to create a state governors council on climate change. This council, named the GC3, developed a recommendation that included an economy-wide GHG emission reduction target of 45 percent below 2001 levels by 2030. The Connecticut General Assembly adopted the GC3’s proposal when they passed the An Act Concerning Climate Change Planning and Resiliency. Finally, Governor Malloy signed the recommendation into law. Relating specifically to HFC reduction, Governor Malloy asked Connecticut’s Department of Energy and Environment Protection (DEEP) to create regulations that phase-out HFCs following California’s CARB regulations as a guide. Maryland- Like many Governor’s previously mentioned, Governor Hogan signed a legislation in 2015 to strengthen Maryland’s Commission on Climate Change. Following that legislation, the Governor signed the Greenhouse Gas Emissions Reduction Act of 2016. The goal of this legislation is to achieve a 25% reduction in Maryland’s greenhouse gases by 2020. It is likely that a short-lived climate pollutant phase-down will accompany the law. Washington State– In December, Washington State’s governor, Jay Inslee, proposed climate change legislation that included $959,000 of funding to eventually phase-out HFCs or as his brief categorized them “super pollutants”. This legislation would reduce greenhouse gas emissions in Washington state by 25 percent below 1990 levels by 2035. This proposal still needs to be enacted by the legislature before the Department of Ecology will begin the regulation process. In the absence of a national HFC phase-down, states have resorted to their own timelines and regulations. This creates a difficulty for those in the HVACR industry to meet differing standards. At Dynatemp International we support a federally mandated HFC phase-down schedule. A federally mandated phase-down of HFCs, like the Kigali Amendment, would provide market clarity, access to global trade, and an increase in U.S. jobs. See more on the Kigali Amendment here. Last year we kept you informed on the status of the Kigali Amendment to the Montreal Protocol, a global phase-down of HFC refrigerants. As we head into 2019 we wanted to provide you with a quick recap and update on the progress of the amendment. The Kigali Amendment to the Montreal Protocol is an agreement between the original members of the Montreal Protocol to phase-down HFC refrigerants by more than 80% over the next 30 years. If fully adopted the amendment has the potential to avoid up to 0.5ºC of warming by 2100. In order for the Kigali Amendment to enter into force, 20 members of the Montreal Protocol had to ratify it by 1/1/19. That was successfully done with over 20 members and now the amendment has officially begun. Of the over 170 members of the Montreal Protocol who originally agreed on the amendment, to date, only 69 countries have ratified it. This could be because the two largest consumers and producers of HFC’s, the United States and China, have not said whether they will move forward with ratification or not. Without their participation, the amendment cannot reach it’s global phase-down goals and will be much less effective. This uncertainty hurts the HVACR industry. Numerous organizations, senators, and CEO’s of major companies in the HVACR industry have asked the administration to send the Kigali Amendment to the Senate for a vote in order to increase jobs, solidify global trade access, and provide certainty for research and development. See the full economic impact of what ratifying the Kigali Amendment would do for the U.S. economy here. While there has been no indication that the United States will ratify Kigali under the current administration, if China ratifies the amendment, and U.S. does not, it could have huge trade implications for the United States. Beginning in 2033, those who have ratified the Kigali Amendment are banned from trading with those who have not. Consider if China moved forward with ratification, they would have the access to trade with Europe, Japan, Mexico, Canada, and many other major and developing countries and the U.S. would be isolated from trading with these countries. Besides climate change and global trade implications, another major consequence of the United States not ratifying the Kigali Amendment is a state by state phase-down of HFCs that will confuse and complicate the marketplace. California has already implemented their own legislation to ban high GWP HFC’s in supermarket applications and starting in 2020 will ban R404A and R507a for new medium-temperature stand-alone units with a compressor capacity of 2,200 BTU/hr or greater, and containing a flooded evaporator, as well as for all new low-temperature stand-alone units. Following California’s lead, Washington state, New Jersey, and Massachusetts have legislation planned to phase-down HFC refrigerants and more states have indicated they will follow suit. It could become very hard for those in the HVACR industry to accommodate differing selling restrictions and phase-down plans on a state by state basis. Interestingly, the absence of Kigali ratification has created more time for the natural refrigerant market to create guidelines and increase charge limit values, which the market needed in order to be widely adopted. If Kigali is ratified we will need a replacement for HFC’s. Currently the best options are HFO’s and/or natural refrigerants. However, if the industry had certainty that the phase-down of HFC’s would be mandated through the Kigali Amendment there could be other HFC alternatives created through research and development.